Asher knows that something in the near future causes Minerva Lambkin, the woman who turned down his marriage proposal, to be erased from existence. And he's sure it has something to do with his device. Alone in a familiar world where he doesn't belong, he'll have to find a way to destroy the time machine to save the woman he loves from extinction. Even if that means erasing his own future. 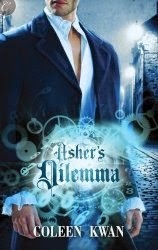 After finishing ASHER'S DILEMMA I was kind of surprised at how few pages it actually was. So much story is packed into this little book that it felt considerably longer. That said it was a fast-paced and exciting read filled with mystery and intrigue as well as a heaping dose of pseudo-science and steampunky elements that were very enjoyable. I didn't realize when I started it that it was actually the second book in a series and I'm happy to say it stands alone nicely enough I was able to enjoy it. The romance feels a bit secondary to the overall time-traveling-trouble story but winds up being so lovely I was really happy with it. If you love a good time travel story with some fun pseudo-science and a hearty mystery I definitely recommend it! I love a good superhero romance story but they are really hard to come by. I've liked Heather Long's paranormal romances in the past so I thought this one would probably be right up my alley but unfortunately I found it a tedious read. I think the biggest problem was that this felt like an everything-but-the-kitchen-sink type of story. There were time travelers, super powered people, mysterious disappearances, not-really-heroes-heroes, and it all just felt really hodge-podge. I hated the hero intensely but if you're into the caveman types (he's even referred to in that term) you might find it enjoyable. Alas, Rory is pretty much a Smurfette and the story ties up where she's the only female in a group with 7 guys. It just was not my cup of tea and the only reason I read more than the first 10 paged was because I knew it was a short story. Having read Badlands ages ago I thought I'd probably need a refresher before I read Clockwork Mafia but I think as long as you read the fairly close together you'll be just fine. 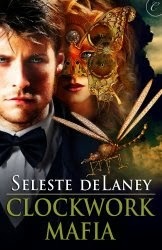 I really love the world building deLaney has done for this series but I found myself struggling to enjoy this one. I just wasn't digging the mafia element at all. It felt out-of-place for some reason and was only compounded by the constant in fighting between Henri and Ever. It wasn't long before I was skimming along for dialog because I wasn't enjoying the plot much at all. Also lacking was the romance. I never quite felt any chemistry between Carson and Henri, the romance definitely took a back seat to the adventure story. If you like steampunk with an American accent you might find it really enjoyable but it just didn't work for me.